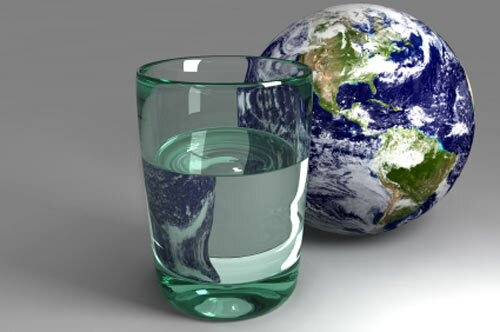 Water is vital to the survival of everything on the planet and is limited in supply. The Earth might seem like it has abundant water, but in fact less than 1 percent is available for human use. The rest is either salt water found in oceans, fresh water frozen in the polar ice caps or too inaccessible for use. While the population and the demand on freshwater resources is increasing, supply remains constant. Managing water is a growing concern in the United States. Communities across the country are starting to face challenges regarding water supply and water infrastructure. It takes a considerable amount of energy to deliver and treat the water you use every day. American public water supply and treatment facilities consume about 56 billion kilowatt-hours (kWh) per year-enough electricity to power more than 5 million homes for an entire year. For example, letting your faucet run for five minutes uses about as much energy as letting a 60-watt light bulb run for 14 hours. If one out of every 100 American homes retrofitted with water-efficient fixtures, we could save about 100 million kWh of electricity per year-avoiding 80,000 tons of greenhouse gas emissions. That is equivalent to removing nearly 15,000 automobiles from the road for one year! If 1 percent of American homes replaced their older, inefficient toilets with WaterSense labeled models, the country would save more than 38 million kWh of electricity-enough to supply electricity to over 43,000 households for one month. Being water-efficient not only helps to conserve a natural resource, but also reduces the amount of energy needed to transport, treat and heat the water used in your home. Test your water sense, follow this link to play the free game. Fix Leaks. You can significantly reduce water use by simply repairing leaks in fixtures (e.g., faucets) and pipes. A leaky faucet wastes gallons of water in a short period of time. Do not let water run unnecessarily. For instance, store drinking water in the refrigerator instead of letting the faucet run until the water is cool. Letting your faucet run for five minutes uses about as much energy as letting a 60-watt light bulb run for 14 hours, and uses up to 8 gallons of water a day! Wash only full loads of dishes and select the appropriate water level or load size option on the dishwasher to use less water. Reuse water in your home. Don't pour water down the drain when there may be another use for it. For instance, when you give your pet fresh water, reuse the old water for your houseplants.